4.0 out of 5 based on 26 bloggers and 7 commenters. 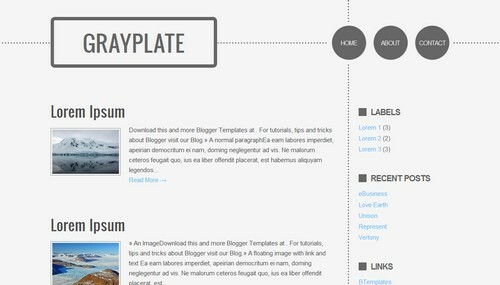 Grayplate is a free blogger template with 2 columns, right sidebar, minimalist, an exclusive design for Blogger, posts thumbnails and neutral colors. This skin is really outstanding, i have tried it on my blog. Just wanted to know that how to add Bottom widget. It will really make this blog more visible. Waiting forward for feedback. Thanks in advance. the preview has been removed, can you put it back up? @Sujay..visit author’s blog and try the same version of this template. It may help you. i want to use this template sinausantai.com ..